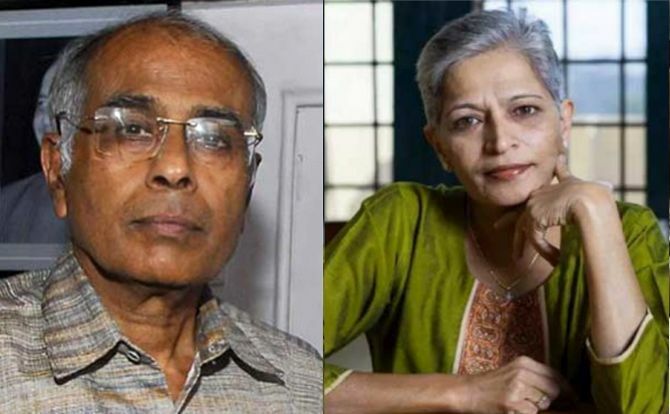 The killings of journalist Gauri Lankesh in Bengaluru last year and rationalist Narendra Dabholkar in Pune in 2013 were "linked", the Central Bureau of Investigation claimed before a court in Pune on Sunday. Seeking extension of the custody of Sachin Andure, one of the alleged shooters in the Dabholkar murder case, the CBI told the court that one of the accused in the Lankesh murder case had handed over a pistol and three bullets with a magazine to him. Judicial Magistrate (First Class) H R Jadhav extended Andure's CBI custody till August 30. Dabholkar, a Pune-based anti-superstition activist, was shot dead while he was on a morning walk in August, 2013. Lankesh was shot dead in front of her residence in Bengaluru in September, 2017. The CBI told the court that the agency would seek the custody of Sharad Kalaskar, another alleged shooter in the Dabholkar murder case. Kalaskar was among the five persons arrested by the Maharashtra Anti-Terrorism Squad earlier this month in connection with the seizure of crude bombs and firearms from various parts of the state. "Kalaskar is currently in the custody of the ATS in the Nalasopara explosives seizure case. The CBI will seek his custody in the Dabholkar case also as he and Andure need to be interrogated together," Special Public prosecutor Vijaykumar Dhakane said. He added that the CBI would also seek the custody of those arrested by the Karnataka SIT in the Lankesh murder case as some of them were "linked" to the Dabholkar case and connected to Andure. "During Andure's interrogation, it was revealed that one of the accused in the Lankesh murder case had handed over a 7.65 mm country-made pistol and three bullets to him and he had passed those over to his brother-in-law, Shubham Surale, at Aurangabad (Maharashtra) on August 11," Dhakane told the court. Surale had passed on the pistol to one Rohit Rege, according to the prosecutor. The CBI had seized a black-coloured country-made pistol with a magazine and three 7.65 mm "live cartridges" (bullets) from Rege's Aurangabad residence, Dhakane said, adding that the agency was probing if the weapon was used to kill Dabholkar. The CBI was also trying to trace the motorcycle used by Andure and Kalaskar on on August 20, 2013, the day they allegedly killed Dabholkar, he said. Opposing the extension of Andure's custody, defence counsel Prakash Salsingikar cited a chargesheet filed by the CBI in 2016 in the Dabholkar murder case. In the chargesheet, the central agency had named Virendrasinh Tawde of the Hindu Janajagruti Samiti, an alleged offshoot of right-wing outfit Sanatan Sanstha, as the conspirator in the killing of Dabholkar. It had identified Sarang Akolkar and Vinay Pawar as the assailants, who had fired bullets at Dabholkar. Quoting certain paragraphs from the chargesheet, Salsingikar said, "The investigation has established through oral and documentary evidence that Tawde, who harboured an enmity with Dabholkar owing to the ideological differences between the Andhashraddha Nirmulan Samiti and the Sanatan Sanstha, criminally conspired with Pawar, Akolkar and others to murder Dabholkar. "In pursuance of the said conspiracy, Pawar and Akolkar shot dead Dabholkar on August 20, 2013 on the Omkareshwar Bridge in Pune." The defence counsel told the court that the CBI was trying to bring in a new theory every time as far as the probe into the Dabholkar murder case was concerned. "As per the chargesheet, the CBI had already identified the assailants in the Dabholkar case," he said. Meanwhile, a CBI officer said that they were awaiting the ballistic report of the pistol seized from Rege's residence. He said it would be premature to say whether the pistol was used to kill Dabholkar. Apart from Kalaskar, the ATS had arrested Vaibhav Raut (40), Sudhanwa Gondhalekar (39), Shrikant Pangarkar and Avinash Pawar (30) in the arms seizure case from various parts of the state. While Raut ran a little-known pro-cow protection outfit, Gondhalekar and Kalaskar are allegedly linked to fringe Hindutva groups. Pangarkar is a former Shiv Sena corporator who hails from Jalna.